PowerPoint is one of the most widely-used pieces of software for slideshows, but did you know it's also one of the easiest tools for creating infographics? You can purchase templates and add your own content, and you'll also get ready-to-go ones in some of our brandable packages at Content Sparks. Your next step is then to edit your PowerPoint infographics so that they reflect your brand and your goals. And that's exactly what I'm going to show you in this tutorial. Whether you're creating them yourself or using our brandable, done-for-you materials, you need to keep your branding consistent across all your content. It's how people immediately recognize that the content is yours. And when it comes to using ‘done-for-you' or private label rights materials…. Having the same branding on all your content makes you look like a professional, rather than someone who's just throwing random-looking content onto the web. In the following video, I walk you through the steps for editing an existing infographic in PowerPoint, using one from our course called ‘From Prospect to Paying Client‘. Click on Design. Then pick an existing theme that has your colors. You can even ‘browse themes', if you click on the down arrow, and find an existing presentation whose theme you want to apply. In the Design tab on the right hand side, next to the theme options, you'll also find a drop-down arrow to pick your colors. So you don't have to use an existing theme. Pick a color theme you've already set up or go right ahead and set up your branded, custom colors right now. Don't forget to save those Custom Colors! You'll want them for every presentation or graphic you create in PowerPoint. Click on any shapes you want to edit. Then click on Format > Shape Fill, and select your color. You'll see the brand colors you already set up right at the top of your choice of colors. Use those for major elements of the graphic, like the background and larger shapes. If any of the infographic elements are ‘grouped', you'll need to ungroup them to change the color on individual parts. In the example, the ‘yes' and ‘no' circles consist of a circle shape and a text box. So they needed to be ungrouped. Click on the element in the graphic that has multiple parts grouped. Then click on Format > Group (down arrow on right) and then click on Ungroup. After that, you can select just the element you want to edit and click on ‘shape fill' again to change that color. You should also ‘regroup' those elements again so that they're easy to move around together in the future, if you want to change any layout. Just click on Group and then Regroup while you have the elements selected. Tip: If you ever want to group items together in the future, hold down the ‘ctrl' key and click on each part you want to combine. The click on ‘Group' to combine them into one graphic. This is a great way to create custom icons and graphics too. If anyone comes across your graphic on or off the web, it's an opportunity to send traffic to your website or another landing page. So put that on your infographic! If there's already a text box at the bottom, like in our brandable infographics, you can click inside it and type in your url. Alternatively, you can select Insert and Text Box. Then draw the text box where you want it and start typing. Remember to format your text so the size, color, and font fit your branding. A big part of visual branding is your logo, so put that on the infographic too. Click on Insert > Picture. Select your logo from your computer, move it to the bottom of the graphic, and resize it to fit in the space there. Tip: When you have any logo graphics created, make sure you have versions that work on both light and dark backgrounds. If you want people to be able to print your infographic, such as for a handout, then save it as a PDF. In newer versions of PowerPoint, you can click on File > Export and then Create PDF/XPS. Otherwise, you can save it as an image by simply selecting that file type in the drop-down choices when you save the file. Click on File > Save As and then click on the file type under the name to select either JPEG or PNG. A JPG file is adequate for sharing on social media. PNG files will be larger and usually higher quality. 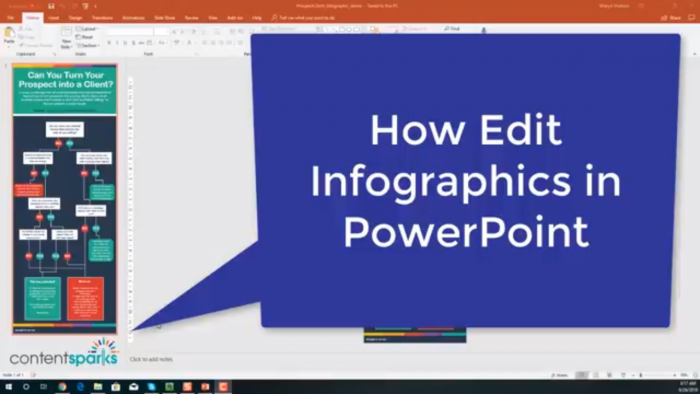 Of course, you can also edit any text in your infographics by clicking where the text is and editing as you normally would in PowerPoint. Want to get your hands on the infographic in the video? 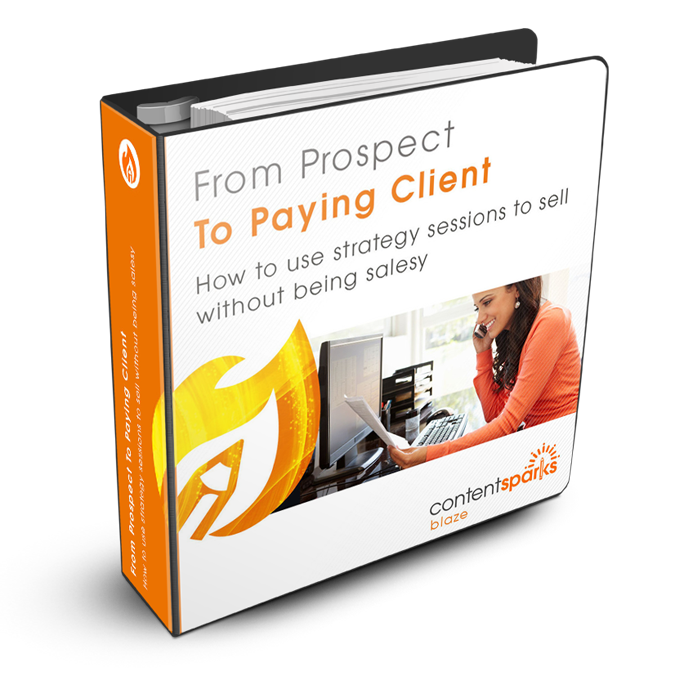 You'll get everything you need to deliver your own program on how to use strategy sessions to sell your services or high-priced offers without feeling ‘salesy'. All the content is editable. All you have to do is add your own branding and insights. Then put your name and logo on and sell or share with prospects and clients.